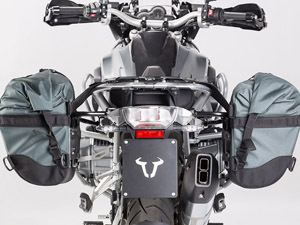 The all new Dakar Soft motorcycle luggage saddlebag system. 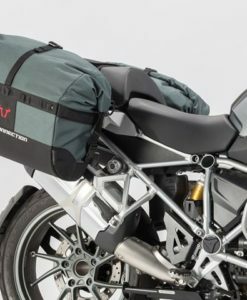 Tailored for adventure and overland touring riders who seek a tough lightweight alternative to conventional aluminium panniers without sacrificing the secure mounting and stability of traditional hard pannier systems. In essence the best of both worlds. Traditional saddle bag offerings require that a rider use their own initiative in making these fit their specific model. 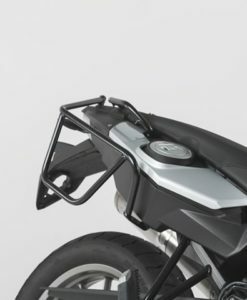 Such systems generally consist of a set of generic bags with no supporting racks and with no model or pillion comfort consideration. 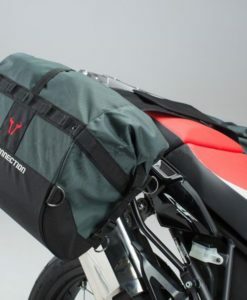 Sagging bags, potentially dangerous if these come into contact with the rear wheel or pillion. Soft pannier bags touching the hot exhaust and being destroyed as a result. The additional expense of purchasing support pannier frames that were never designed for a soft luggage configuration. 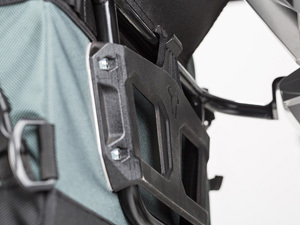 The requirement for excessive straps to secure the bags to wherever possible on the bike/ support frame. The added burden of remembering to ensure that there are no loose strap ends that could get caught in the rear wheel. 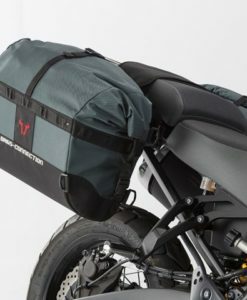 The Dakar soft bag luggage kit removes all these drawbacks as a result of it being a model specific solution with an unique connection system. 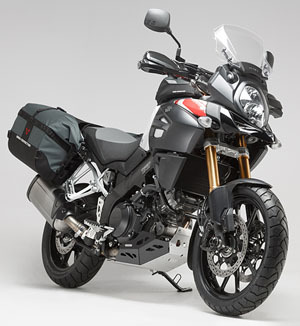 Each kit is supplied with carrier racks and a set of Dakar soft panniers tailored for that model. Nothing more is required to ensure a perfect fit to your bike. 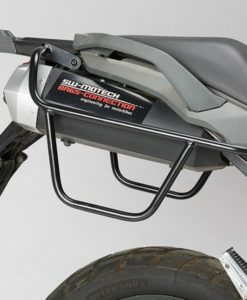 Features found in every Dakar pannier kit. A unique semi-rigid ABS honeycomb core that runs from front to back. This stiff core is absent of sidewalls which allows the bag to retain its shape for easier packing, yet compress upon impact. This is a point not overlooked by any off-road rider who inevitably drops the bike from time to time. A waterproof removable inner layer to protect the contents from water crossings. Simply remove this inner with its contents, when you arrive at your destination. 1680 denier ballistics nylon surpasses leather, Cordura and nylon in strength. In abrasion tests conducted against nylon and leather, ballistic scored highest. Leather scuffed at 25 cycles, nylon failed at 295 cycles, while ballistic was only affected after 3000 cycles. In tests conducted to measure tear resistance, nylon started tearing at 5 lbs  ( 2.3 kgs), Cordura tore at 74 lbs (33.6 kgs), but ballistic held strong at 250 lbs (113.6 kgs)! 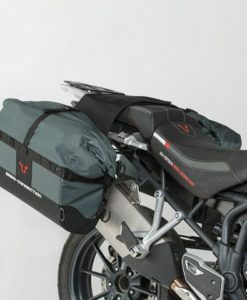 If one considers that a lot of motorcycle riding jackets and pants are made from 600 D or 1000 D Cordura, you can figure out for yourself how tough these Dakar bags are. Ballistic nylon is also approved by the U.S. Military for use in bulletproof vests. 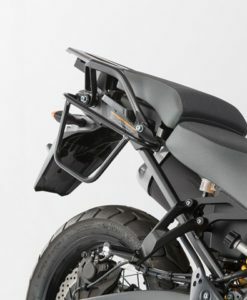 Another unique feature of the Dakar saddlebags is their ease of mounting. 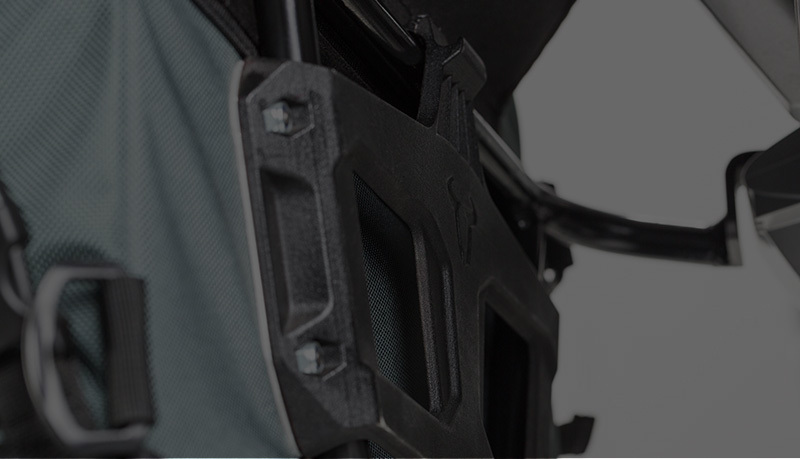 Simply slide the bag up onto the carrier frame, where a specially designed clip and cradle holds them in place. 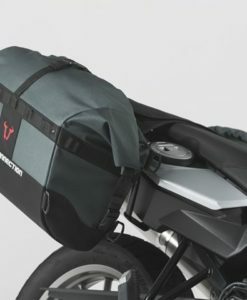 To take the weight of fully laden bags large velcro straps fasten over the pillion seat distributing the weight optimally, without affecting the comfort of your pillion rider. 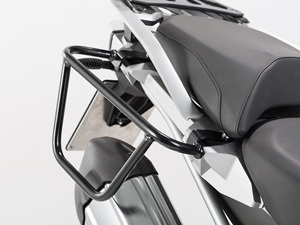 As a result there is no strain on the pannier frames as the seat carries the lions share of the weight. One less thing to go wrong. 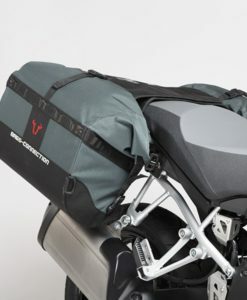 Each bag offers 32 liters of storage capacity (64 liters in total) while the tried and tested roll-top and Velcro closure allows quick and easy access to the contents. shortcoming of most soft luggage) as the bag retains its shape. 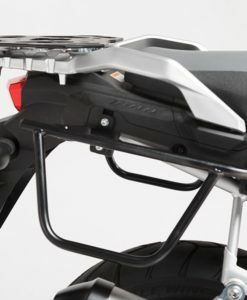 This core also adds protection to the contents, in the event of the bike being dropped. 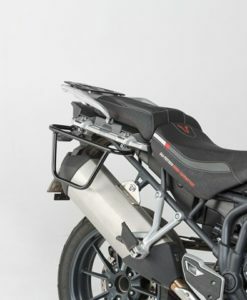 For additional gear attachment a daisy chain of looping on the Dakar’s outer edges, and  large D-rings at the outer corners offer multiple tie-down points for items such as sleeping bags and tents. 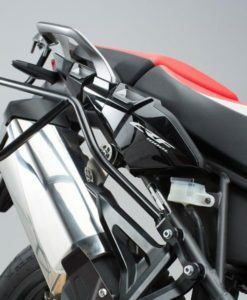 Designed to complement your bike. 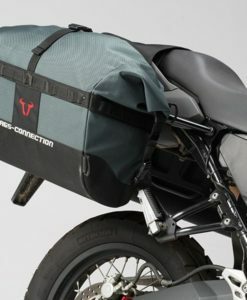 Regardless of which model you fit the Dakar panniers to, they will always remain vertical relative to your bike. No sagging or disproportionate spacing between each side. Every time, with ease. 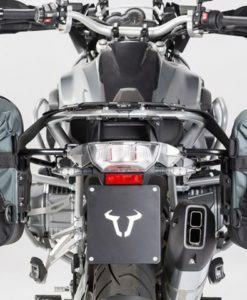 Stable, super rugged, lightweight pannier saddle bags especially for the BMW R 1200 GS LC. 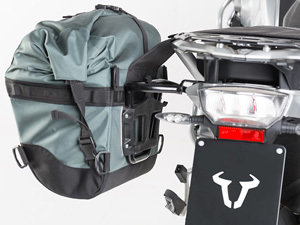 Tough off road adventure motorcycle soft panniers tailor made for the F 650 /700/800 GS. 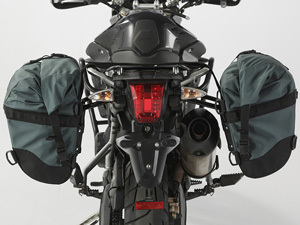 Tough Tiger 1200 adventure panniers for rugged overland and all-terrain use.